October 27, 2011: Happy Halloween! As usual, the office is closed for our Halloween Game Day. This year, due to folks flying to this end of the country and the other, our festivities will be held today, October 27. We'll be celebrating the spookiest holiday by eating too much sugar and playing games around the office. We'll deal with e-mail and voice mails on Monday. 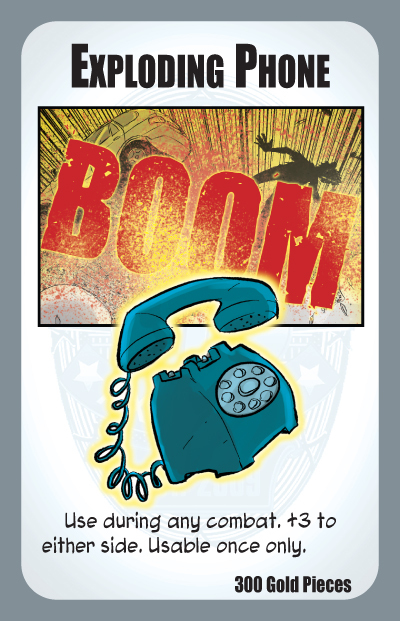 In the world of Axe Cop, anything can suddenly explode. That's just the way his Awesomeness interacts with inanimate objects. For instance, telephones can be used as weapons . . . Exploding Phones, at least. 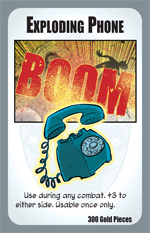 Exploding Phones is just one of many one-shot combat modifiers you can find in Munchkin Axe Cop, heading to stores now!